Don't wait. It's time to Bid Now! WYSO's online Auction has some great items. Your bid goes to support WYSO, Public Radio for the Miami Valley. 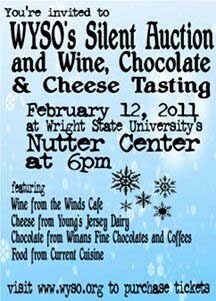 Don't forget to get your tickets for our Silent Auction, Wine, Chocolate & Cheese Tasting on Saturday, February 12th.